A graded ski run at Iron Mountain ski area, 13 years after abandonment. To read Jennifer Burt and Jeffrey Clary’s full study visit onlinelibrary.wiley.com and type “abandoned ski slopes” in the search field. LAKE TAHOE, Calif. — In 1995, the ski resort at Iron Mountain — located off of Highway 88, about 20 miles west of Kirkwood Ski Resort — halted operations for good. Gone was the team of groomers tending to the slopes. Gone were the skiers and riders sweeping down the mountainside. Iron Mountain Ski Area was abandoned. Twenty years later, though, one can clearly see — within the 1,699 acres of land — where the groomers had groomed and the riders had ridden. The reason? Many of those areas aren’t able to grow lush plant life due to previous ski resort operators damaging the terrain. This is what University of California, Davis ecologists Jennifer Burt and Jeffrey Clary unearthed in a recent study of six shuttered ski resorts throughout the northern Sierra Nevada, including Powder Bowl/Deer Park Ski Area (near Alpine Meadows), Plavada (at Soda Springs), Tannenbaum (near Galena), Edelweiss (near Twin Bridges), Echo Summit and Iron Mountain. Their study, which was published in the Journal of Applied Ecology on Dec. 16, found that abandoned ski resorts with “graded” runs show no predictable recovery, even 43 years after abandonment. Grading a ski run is the process of using heavy machinery to remove vegetation, boulders and much of the topsoil. “It reduces the ability of the area to support healthy plant growth,” Burt said of grading ski runs. “It also reduces infiltration of the rainfall into the soil, which, in turn, causes — during rain events — more water to sheet over the surface, which then, in turn, can increase sediment loss and erosion. 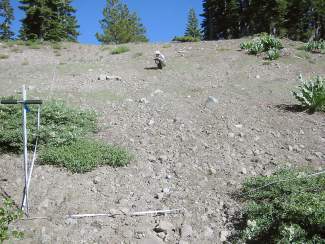 According to the study, the graded runs did typically regrow some trees and other plant life, but the growth was minimal — and unpredictable — in comparison to the cleared runs. This begs the question: Why do ski resorts grade runs? 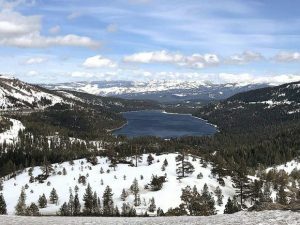 Ski resorts with graded runs were able to open up to two weeks earlier than resorts with only cleared runs, said Burt, a UC Davis doctoral student at the time of the study. She is currently a restoration ecologist at AECOM Environment in Sacramento. “I was monitoring active ski areas, and the cleared ski runs were opening a week or two later,” Burt said. Even though grading requires more labor and costs for ski resorts, it is widely practiced in the ski industry, she added. 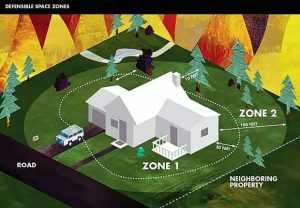 Burt said there are efforts that can be taken to actively restore graded ski slopes in-between seasons. And while ski area closures aren’t currently increasing, the potential for such shutterings is, Burt said.